Our Home Family Resource Center and Kiwanis Club of Celina are partnering distribute new and/or clean, gently-used coats to folks in need on “Winter Warmth Day” Saturday, October 27th. 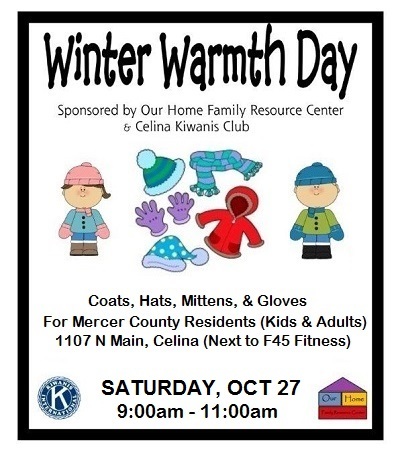 Mercer County residents who are unable to purchase a coat this year, for their children or themselves, are invited to pick one up on “Winter Warmth Day” Saturday, October 27th, at 1107 N Main Street (Celina) – Chief’s Shopping Center, next to F45 Fitness. Doors will be open from 9:00am through 11:00am. If you would like to help with this worthwhile project, donations of coats, hats, and gloves will be accepted through October 22nd and may be dropped off at Our Home, 117 W Fayette Street, in Celina or placed in one of the “Winter Warmth Day” collection boxes located in businesses and churches across Mercer County. If you would like a collection box for your church or business, call Our Home at 419-586-4663.